Olympia is the capital of Washington state, conveniently located 20 miles south of Joint Base Lewis-McChord and 50 miles south of Seattle right on I-5. 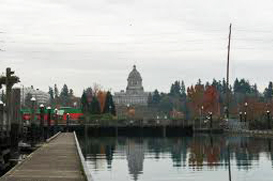 Olympia has a beautiful port and marina in the downtown area along with wonderful parks and wilderness areas spread out around the city. The Evergreen State College is located in Olympia and is a world-renowned liberal arts college. Whether you’re an outdoor enthusiast or love the feel of city living Olympia will meet all of your needs.